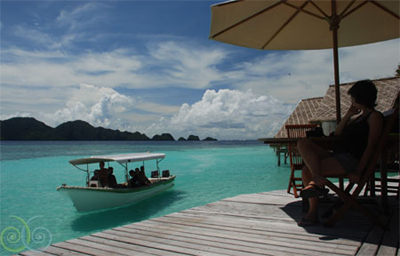 Indonesia is the largest archipelago in the world, stretching 3,200 miles from east to west. 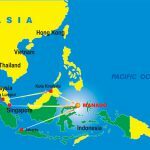 It is located in Southeast Asia, neighboring the countries of Malaysia, the Philippines, Papua New Guinea, and Australia. The country is divided into 4 groups: The Greater Sundas composed of Sumatra, Java, Kalimantan and Sulawesi, The Lesser Sundas consisting of the smaller islands from Bali eastward to Timor, Maluku composed of all the islands between Irian Jaya and Sulawesi, and Irian Jaya in the extreme eastern part of the country. Air transport from the US to Indonesia is very accessible. The three main gateways are Soekkarno-Hatta International Airport in Jakarta, Polonia Airport in Medan, and Ngurah Rai Airport in Bali. Several airlines service these airports. There are also privately owned airlines which offer chartered flights. The flight from Los Angeles to Denpasar (Bali) is approximately 22 hours, and from New York it is 27 hours. Depending on where your final destination in Indonesia is, the flight can be longer. Indonesia is divided into three time zones: Western Indonesia Time (Sumatra, Java, west and central Kalimantan) is seven hours ahead of GMT and 16 hours ahead of US Pacific Standard time. Central Indonesia Time (Bali, south and east Kalimantan, Sulawesi, Nusa Tenggara) is eight hours ahead of GMT. East Indonesia time (Maluki, Irian Jaya) is nine hours ahead of GMT. Bahasa Indonesia is the national language. English is widely spoken for business and travel. In the bigger cities, Dutch is also spoken. French is gaining in popularity. 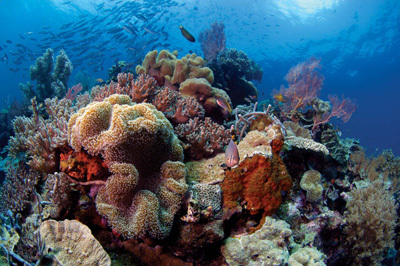 Indonesia makes up one corner of the Coral Triangle and contains 20% of the world’s coral reefs! It’s no wonder that these waters are virtual epicentres of biodiversity. With 600 species of coral and over 3000 fish species, you’ll quickly start checking items off your “must see” list. Whether you’re exploring muck diving at its best in Lembeh Strait, the incredible diversity of Bunaken National Park, or the rich seas of Raja Ampat, you’ll quickly realize why the waters of Indonesia are so scientifically important. Combine different dive areas into one trip, and you’ll be in for the underwater adventure of your life! Indonesia is a tropical country. June through September is the dry season, and December through March is the rainy season. A period of mixed sunshine and thunderstorms marks the transition between dry and rainy seasons. Temperature ranges between 70-90 degrees Fahrenheit. Visitors are advised to wear light clothing. Cotton and linen are the most comfortable. “Batik” is the local fabric for men’s shirts and women’s dresses. These items can be purchased quite easily. 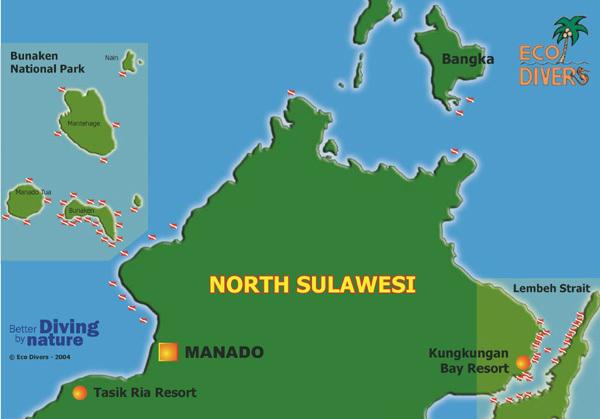 Celebes Divers operates out of Mapia Resort in Manado (right) and Onong Resort on Siladen Island (below). Four large traditional wooden boats carry up to 40 divers in total and are each equipped with an oxygen tank, first aid kit and toilet. The crew, who are all trained in Emergency First Response, will also set up your dive equipment for you. Dive equipment is available for rent and Nitrox is FREE for appropriately certified divers. During the dives you will be guided in small groups of 4-5 divers for safety reasons, as well as to guarantee that everyone can enjoy observing even the smallest critters. Of course, the professional guides give everybody more than enough time and space to film or photograph everything. The groups are organized according to experience level to ensure that all divers get the most out of their dives. In between dives, cookies, fresh fruit, water, tea & coffee are served. 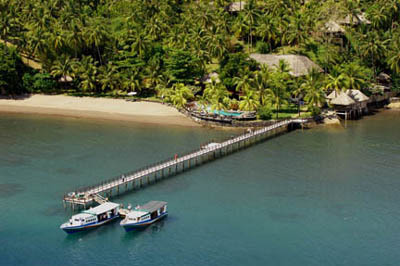 Most of the diving from Mapia Resort is done on the Sulawesi coastline, which can be described as a cross between Lembeh Strait and Bunaken Island. 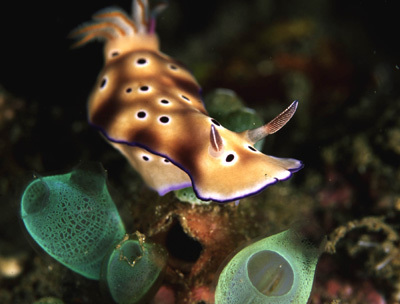 On some dive sites you can find the best of both worlds…critters and nudibranchs in the beginning, followed by beautiful corals in a coral garden or at a small wall. 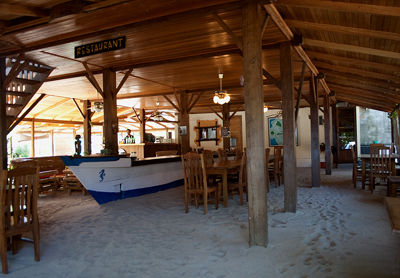 After two dives in the morning you’ll return to the resort for lunch at around 1 pm. 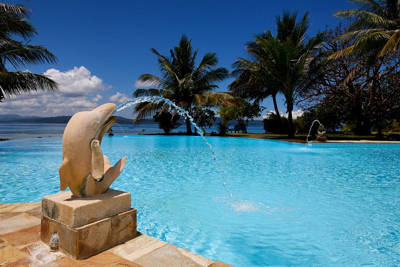 After lunch you may spend the afternoon however you’d like: relaxing in the pool, shopping in Manado or enjoying another boat dive at around 3 pm or a dive on the house reef with or without a guide. 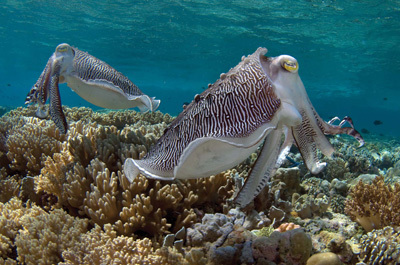 Around 6 pm you may choose to enjoy a night dive on the house reef to see a completely different set of creatures. Although diving the Sulawesi Coast is diving at its best, trips to Lembeh Strait and Bunaken Island, as well as Mandarin Fish dives, are organized weekly. Most of the diving from Onong Resort is done on the islands of Bunaken and Manado Tua, where stunning walls drop down to 300 meters or more. 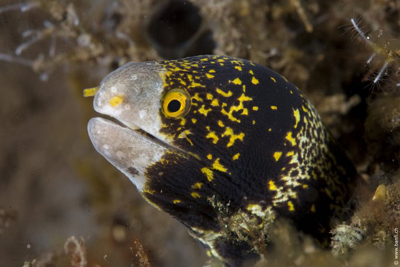 Most of the dives are “drift-dives” with currents ranging between moderate and quite strong. The boats with their skilled crew will be standing by to pick you up as soon as you surface. 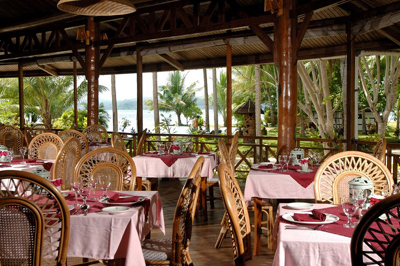 After two dives in the morning you’ll return to the resort for lunch at around 1 pm. After lunch you may spend the afternoon however you’d like: relaxing on the beach or enjoying another boat dive at around 3 pm or a guided dive on the house reef. Around 6 pm you may choose to enjoy a guided night dive on the house reef to see a completely different set of creatures. 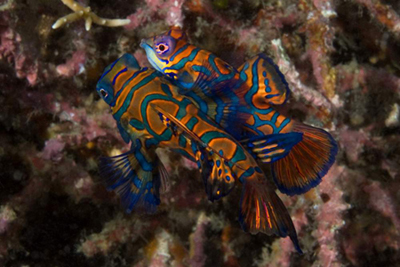 Mandarin Fish dives are also organized on a regular basis. Operating out of Kima Bajo Resort & Spa, this PADI 5 Star IDC operation is perfectly positioned for easy access to Bunaken National Marine Park. 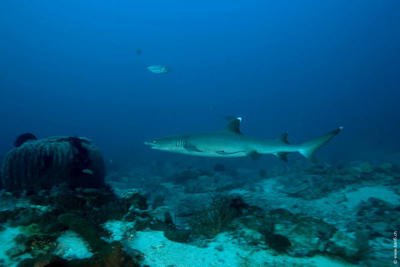 Eco Divers provides a highly organized, personalized, relaxing and safe dive experience. 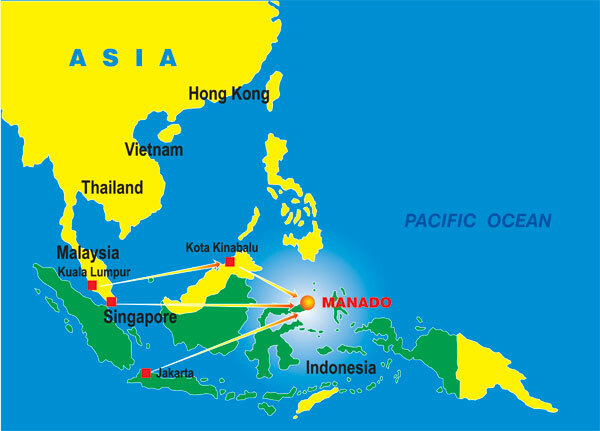 The dive guides are among Manado’s most experienced and a maximum of four divers per dive guide is guaranteed. 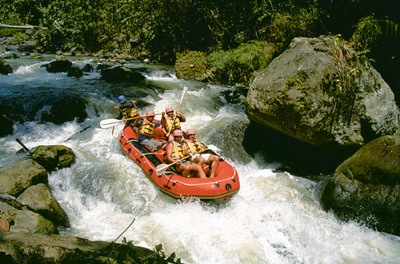 Guests dive from three purpose-built dive boats. Dive capacity is limited to just 8 divers per boat. Each boat is also licensed for an additional 4 snorkelers/boat-sitters. The boats are fitted with every comfort and safety feature one needs to enjoy a dive trip: dive ladder, sundeck with sun beds, shaded salon with comfortable seating, toilet & shower, fresh towels and free snacks, fruit, and unlimited tea & coffee throughout the day. 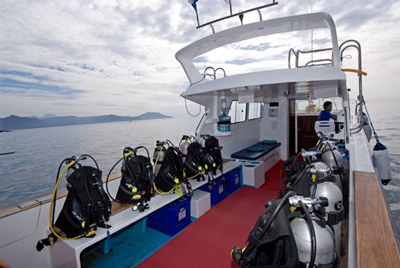 The dive program consists of a two-tank morning boat trip and a one-tank afternoon trip. 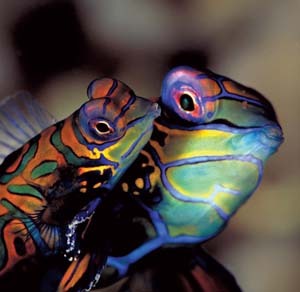 Twilight Mandarin Fish Dives and Night Dives are also offered. Eco Divers is home to The Digital Centre, North Sulawesi’s first dedicated facility for photographers & videographers, providing rentals, sales, courses, souvenirs and workshops. A camera room is also available, with work stations and charging points. Eco Divers is a PADI 5 Star Instructor Development Centre, offering a full range of PADI training courses including introductory dives, entry level training, continuing education, specialty courses and vocational training to instructor level. Minahasa Lagoon’s PADI registered dive center is managed by European dive instructors and assisted by professional dive guides, all of whom are multilingual. 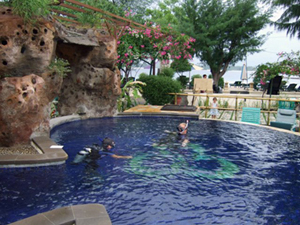 You may obtain PADI certifications up to Dive Master level. In addition to diving or snorkeling in the world famous Bunaken National Marine Park, the resort also offers excellent dive and snorkeling sites right at its doorstep (where a large variety of critters and other rare species commune). The dive center is fully equipped with the newest Scubapro gear, the latest Bauer compressors, enriched air (Nitrox membrane system), and 12 and 15 L steel and aluminum tanks with mono INT valves (double valve and DIN adaptors are also available). 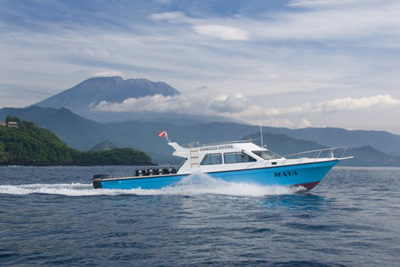 Specially developed for divers, the traditional dive boats are comfortable and roomy and come equipped with first aid kits, oxygen tanks, toilet, and fresh water for showering and rinsing off. 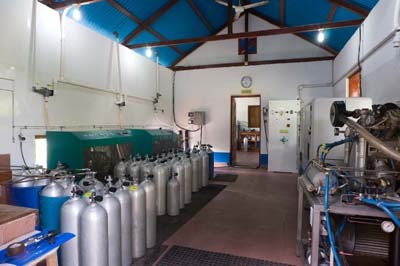 Manado Hospital, equipped with a hyperbaric chamber, can be reached in less than one hour from most of the dive sites inclusive of the resort. For over twenty years, Murex has been sharing the treasures of Bunaken National Marine Park, Bangka Island, Lembeh Strait and the Sangihe-Talaud archipelago with lucky divers from all over the world. What began as one of the first dive resorts in the area has grown into 3 dive resorts and two liveaboards. The success of Murex is based on unforgettable diving, awesome choice, unbelievable underwater photo opportunities, legendary personal service and great accommodations & food. Continuing to be pioneers in the industry, Murex was the first dive operator in North Sulawesi to produce Nitrox and mixed gas for tri-mix and rebreathers. 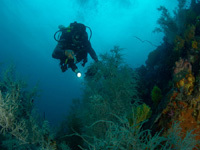 Over 100 dive sites are easily accessible from the 3 resorts. Experience dozens more by sailing on a liveaboard. All instructors and dive guides are PADI, NAUI & SDI certified and most have been with Murex for years! This 5 Star PADI IDC dive center is located at Santika Resort Manado, conveniently situated for exploring the diverse underwater wonders of Bunaken National Park. 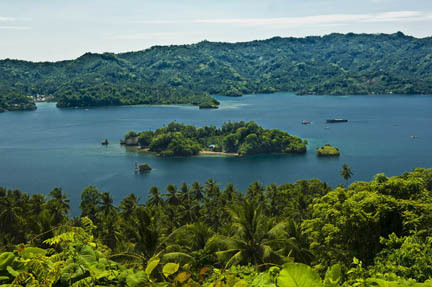 Special trips to Lembeh Strait or the Bangka Archipelago may also be arranged. 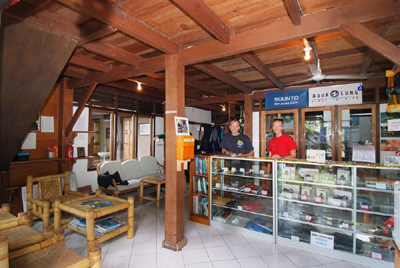 The dive center features a front desk & shop, an equipment service center, the Lion Fish bar, and 40 sets of Aqualung & Seaquest rental equipment. Digital cameras and other equipment may also be rented. A full range of PADI courses and certifications is offered. Free wireless internet is available. Seven dive boats can carry between 6 (Thalassa 8) & 16 (Thalassa 12) divers each. Boats leave 4 times a day. Night dives are also regularly scheduled and are very highly recommended! Your equipment will be carried, washed, and stored for you. A maximum of 4 divers per guide is the norm. 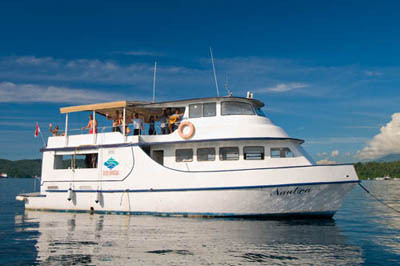 Snorkelers are welcome, and land & sightseeing tours may also be arranged. Come experience the diversity and richness of North Sulawesi for yourself! 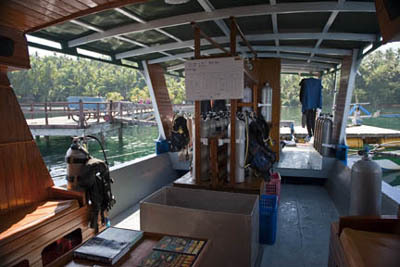 Operating out of Lembeh Cottages, this PADI 5 Star IDC operation is perfectly positioned for easy access to Lembeh Strait. 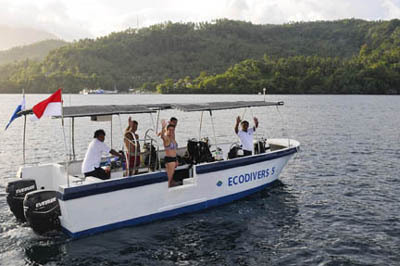 Eco Divers provides an organized, personalized, relaxing and safe dive experience. 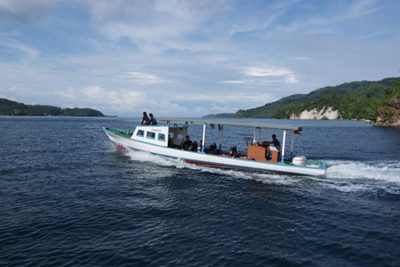 The dive guides are among Lembeh’s most experienced and a maximum of four divers per dive guide is guaranteed. 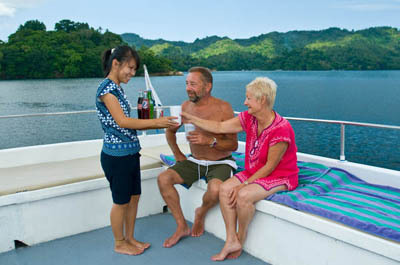 You’ll dive from a “Day Live-aboard” located in a prime central position in the middle of Lembeh Strait, giving fast & easy access to all 40 Lembeh dive sites. 2 dive skiffs comfortably carry 8 guests, 2 guides and a captain. Each skiff has twin jump gates and a stainless steel dive ladder for easy entry/exit. Just as with any good live-aboard, guests dive from the skiffs and then relax on board the main boat during the surface intervals. The live-aboard offers every comfort and safety feature one needs to enjoy a full day’s diving including a shaded salon with comfortable seating, toilets & showers, charging points for camera batteries & laptops, a large sun deck with sun beds & shaded areas, fresh towels and an onboard Hospitality Hostess. Snacks, fruit and hot & cold drinks are served between dives 1 & 2 (and also between dive 3 & the Mandarin Fish or Night Dive, if guests are staying on for the extra dive). After the 2nd dive a hot buffet lunch is served. 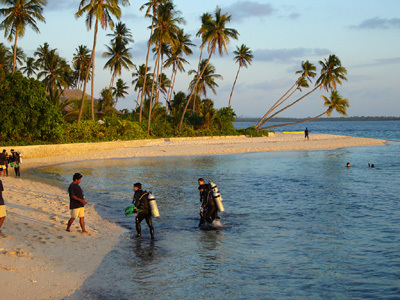 After the last dive of the day, guests are transferred back to the resort by air-conditioned vehicle. This 15 minute drive is a great opportunity to see a bit of Indonesian life outside the resort’s walls. 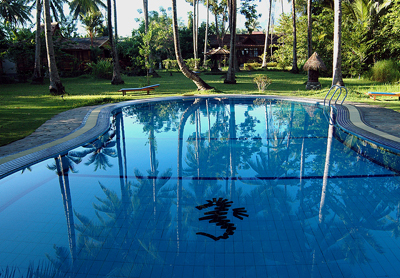 Based at Lembeh Resort, Lembeh Divers is only a few minutes away from most of the 40+ dive sites within the Strait. The dive center boasts a dive shop, equipment rinsing & drying facilities and a camera room complete with personal charging stations. Your equipment will be carried, loaded, rinsed and stored by the courteous and attentive dive team. Dive equipment rental and nitrox are available. 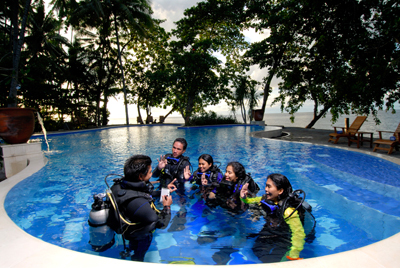 A full range of PADI courses is offered. 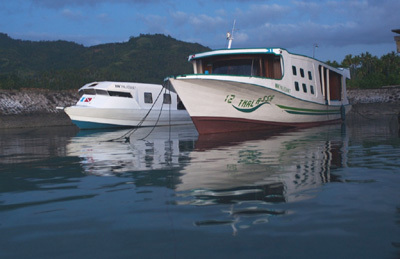 Lembeh Divers boasts four comfortable and efficient dive boats and a smaller speed boat for charters. Boats depart at 8:00am, 11:00am and 2:30pm. Additional guided dives include early morning house reef dives, evening Mandarin fish dives, night dives and late night dives. 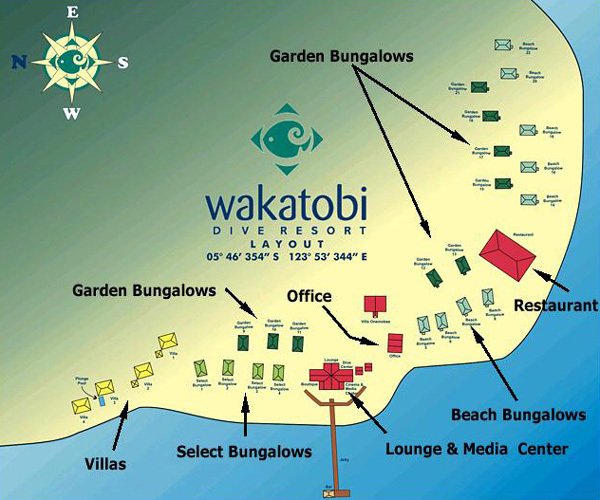 Self-guided house reef dives are also available. The infectious enthusiasm of the dive team, and a guest to guide ratio of 3:1, will allow the personal attention needed to cross as many critters off your wish list as possible. 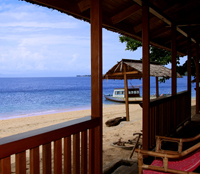 Gangga Divers is a PADI Five Star Dive Center located at Gangga Island Resort & Spa. 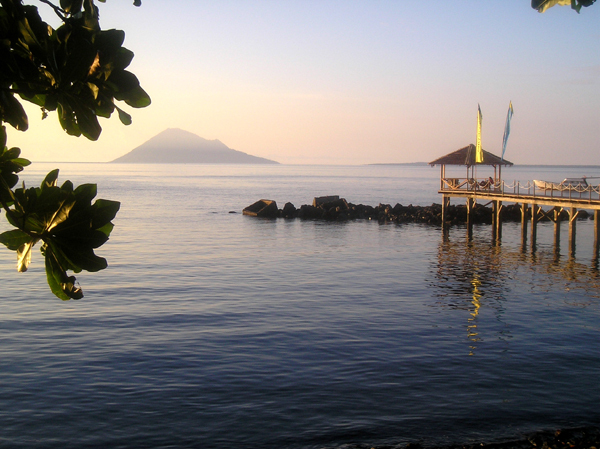 The location of the resort and dive center makes it an ideal starting point for diving Bangka Island, Bunaken National Marine Park, and Lembeh Strait. The dive center offers equipment storage racks, toilet & hot shower facilities, and a regulator service room. Five all-wood boats, specifically built for diving, offer easy on/off access, towels, freshwater camera rinse tanks, drinking water, hot drinks, and snacks. Three have onboard toilets. Qualified guides and dive masters take pride in offering personalized service, no matter your level of diving expertise. Come experience the world-class diving that attracts marine biologists and underwater photographers from all over the world! 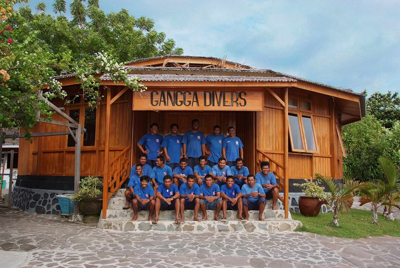 Gangga Divers is a PADI Five Star Dive Center located at Lotus Bungalows on the island of Bali. 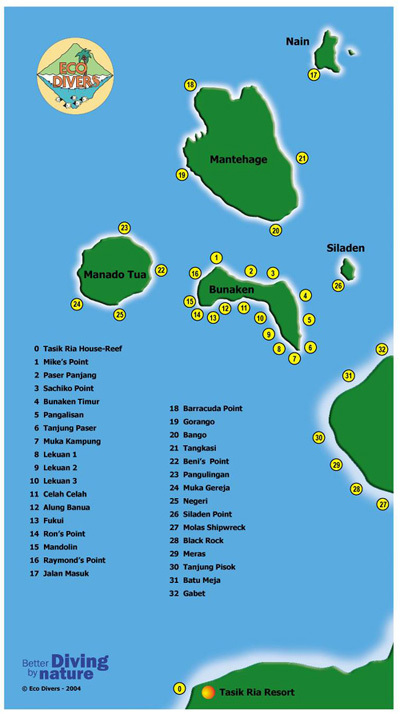 The dive center is perfectly positioned for reaching Bali’s best dive sites. 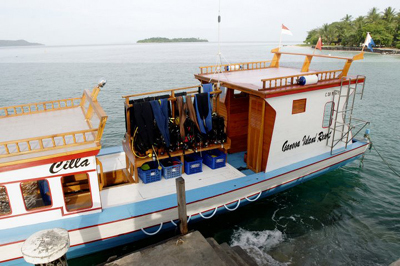 One of two comfortable dive boats will transport you quickly and safely to your scheduled dive sites. 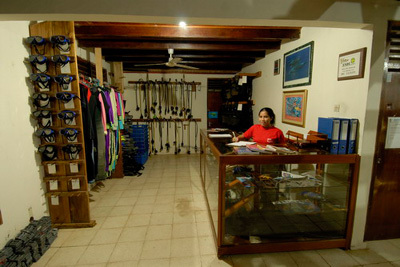 Qualified guides and dive masters take pride in offering personalized service, no matter your level of diving expertise. 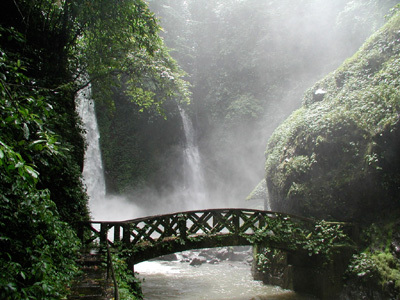 Come experience the wide range and variety of sites that can be found around the island of Bali! 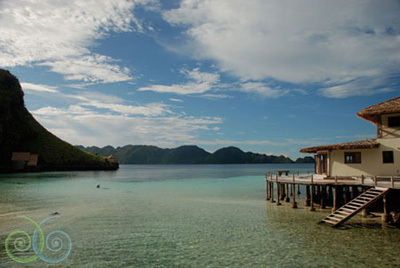 Misool Eco Resort’s Dive Center is located in the North Bay, built on stilts over the water. The Dive Center has been designed to meet the needs of pro videographers & photographers, with separate wet and dry areas, as well as individual diving equipment stations. The wet room is furnished with plenty of camera tables and work stations, while the dry area offers computer stations, comfortable lounge chairs, and a monitor for viewing the day’s images. Perhaps best of all, there is a spacious sundeck on which to enjoy the spectacular topside views. Misool Eco Resort has explored over 60 spectacular dive sites within a 1 hour boat ride of the resort, 20 of which are just 10 minutes away. Three boat dives are scheduled per day, and night dives are scheduled every other night. 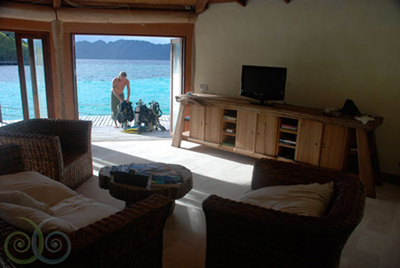 Depending upon the dive package you choose, you may also do House Reef dives and night dives. With Wakatobi Dive Resort, you will enjoy your choice of over 40 pristine reef dive sites, as well as the most beautifully diverse house reef in the world! The reef starts right off the beach, drops off about 80 yards from shore, and is over 3 miles long. Buddy teams may begin unlimited diving of the house reef from 5:00 am through 10:00 pm. 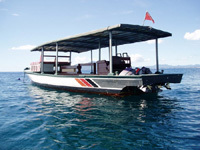 Taxi boat service is available for exploring different areas of the reef. The house reef and many other dive sites also offer excellent snorkeling opportunities. 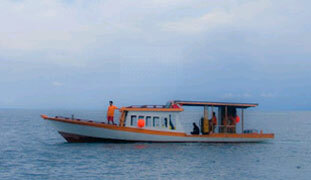 Four traditionally crafted dive boats are spacious and well-equipped, and can comfortably accommodate up to 14 divers. They are 70 feet long and feature a large camera platform, rinse tank, toilet, fresh water shower, oxygen, GPS, and marine radio. Snacks, liquid refreshments, & dry towels are readily available. Boats depart twice every morning and once in the afternoon. 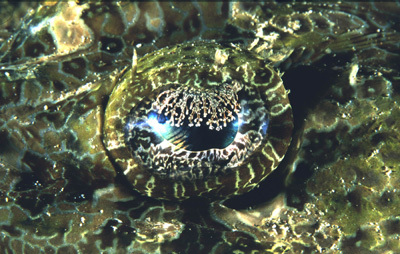 Night dives are offered approximately twice a week. All gear is loaded, unloaded, and stored for your convenience. 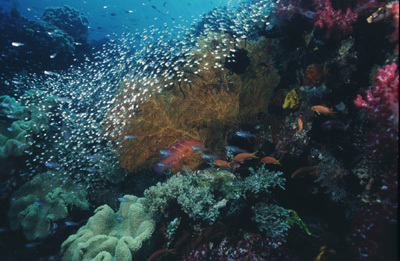 Located about 15 km from Manado, Bunaken National Marine Park is a stand out favorite. Do not miss the coral reefs of this national park and the drop-off walls at Liang Cove. 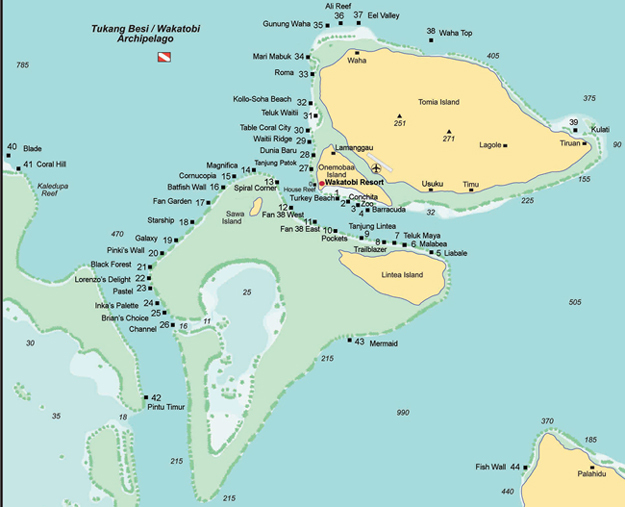 There are over thirty 5-star dive spots here. The great concentration of coral species, tropical fish and larger pelagics make for world-class diving. This gently sloping wall boasts a mild current and good visibility. 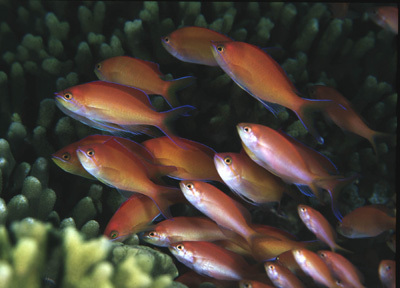 Enjoy a wide variety of shrimp species, anthias, turtles, shoals of fusiliers and a field of garden eels. The Lekuans are 3 parts of a long wall that is considered by many as the park’s best dive spot. 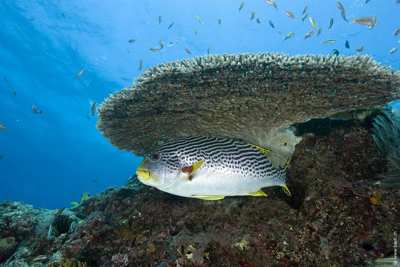 Walls filled with sea fans, giant sponges and anemones are frequented by anthius, bumphead parrotfish, reef sharks, turtles, Napoleon wrasses and schools of snapper, fusiliers and pyramid butterflyfish. Dramatic drops, overhangs, cuts, holes, pinnacles, and outcroppings also provide an interesting backdrop for nudibranchs and sea snakes. Look carefully along this wall for the “masters of camouflage”. Crocodile flatheads, leaf fish, ghost pipefish and frogfish seem to blend into their surroundings, but good visibility and a mild current allow you the opportunity to take a closer look. There’s a good chance you’ll also spot turtles, sleeping white tip sharks and eagle rays while you’re at it. A great reef crest and a wall full of surgeonfish, unicornfish, bannerfish and schooling fusiliers, all of which are accustomed to divers and easy to approach. 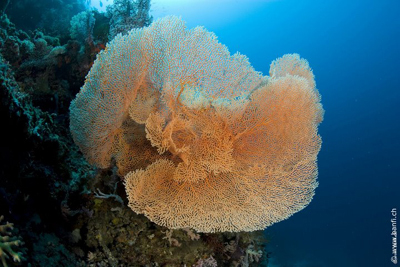 Table coral, sea fans and anemones attract anthias, turtles, sharks, Napolean wrasses, eagle rays, morays and much more! This long wall with strong currents makes for an excellent drift dive. Lots of interesting and colorful nudibranchs, feather stars, sea urchins, sponges, tunicates and anemones. Overhangs and small caves mark the wall and provide interesting terrain for sharks, turtles, eagle rays, blue spotted stingrays, scorpion fish, lionfish, sea snakes, dugongs and other creatures great and small. This steep wall on the south side of Siladen Island has a beautiful wall of soft corals that bloom when the current is running. Enjoy table coral, nudibranchs, anemones, a wide variety of crustaceans and large schools of pyramid butterfly fish and fusiliers. Described by many as the muck and critter diving capital of the world. 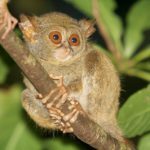 The geology, geography and topography of Lembeh Strait combine to provide the ideal habitat for the widest variety of rare and unusual tropical marine critters to be found within close proximity anywhere in the world. It’s an absolute must for any serious diver! 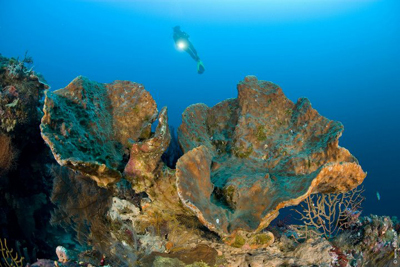 Each of over fifty dive sites will intrigue and amaze you. Here are some of our favorites. A fringing reef decorated with giant sea fans and sponges descends to 80′ and features molluscs, squat lobsters and nudibranchs as well as mantis shrimp and crab-eyed gobies in the shallows. Also see Leaf scorpionfish, Reef stonefish, lionfish, pygmy seahorses, flounders, juvenile Barramundi cod, juvenile Harlequin sweetlips, juvenile Pinnate batfish, lizardfish, filefish, cardinal fish, frogfish, crabs, pipefish, cuttlefish, Wonderpus octopus, Blue-ringed octopus, morays, Shorthead fang blennies, ribbon eels, and Striped catfish. A healthy reef and coral patches feature a variety of anemones and an even greater variety of critters! Ghost pipefish, cuttlefish, scorpionfishes, eels, nudibranchs and tons of crustaceans! 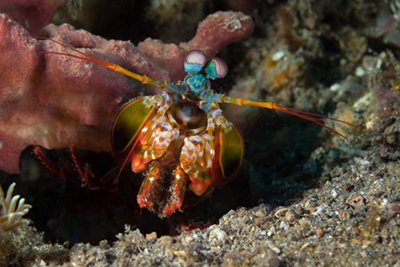 Orang-utan crabs, Dardanus hermit crabs, Candy crabs, Porcelain crabs, Sea pen crabs, Spider crabs and Xeno crabs cohabitate with Humpback prawns, three varieties of lobster and over 15 different species of shrimp! One of the newer sites discovered by dive guides. Great muck diving with lots of purple heart urchins, Zebra crabs, Ambon scorpionfish, frogfish, cuttlefish, Wonderpus and Mimic octopuses and eels. Also spot stargazers, stonefish, flying gurnards, lionfish, velvetfish, waspfish, sea moths, dragonets, lizardfish, filefish, Banggai cardinal fish, Zebra batfish, pipefish, seahorses, a plethora of nudibranchs, twelve varieties of shrimp, squid, morays and more. A hard coral garden in the shallows preceeds a sandy plane which gently slopes to meet an impressive wall. Ribbon eels, Pearl-eyed morays, sweepers, scorpionfish, leaf fish, devilfish, cuttlefish, lionfish, flying gurnards, Pegasus sea moths, orange & black dragonets, flounders, Carpet sole, Welander’s flatheads, lizardfish, Whitebar filefish, Pajama cardinal fish, Circular batfish, Razor fish, frogfish, pipefish, seahorses, a huge variety of nudibranchs, shrimps, crabs and much more. 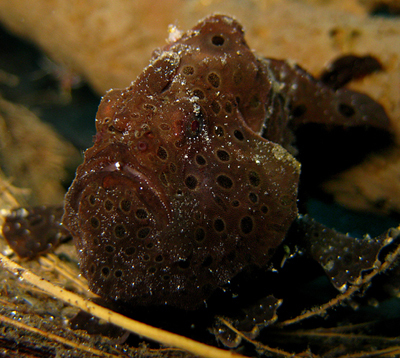 Frogfish and Ambon scorpionfish are among the many critters that you’ll encounter on this black sand muck dive. 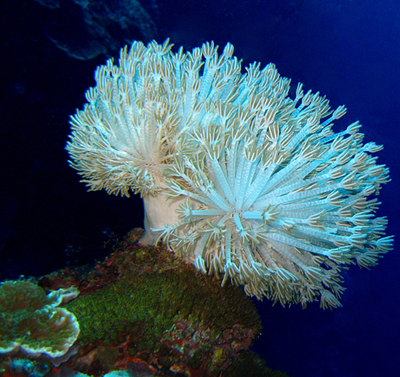 A small, healthy coral stand can be found in the shallows. Good variety and numbers make this one of the more popular sites. 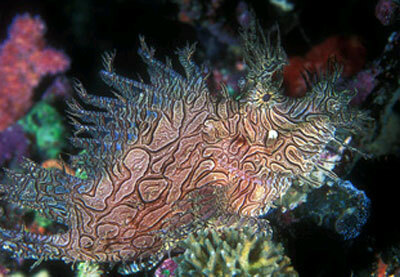 Prevailing creatures include lionfish, Cockatoo flounders, sea horses, Filamented ghost pipefish and many nudibranch and slug species. Mass mating and egg laying of the Gymnodoris ceylonica nudibranch occurs here on an irregular basis. Will you be one of the lucky spectators? Spot the infamous Rhinopius on one of the best muck dives in the strait! 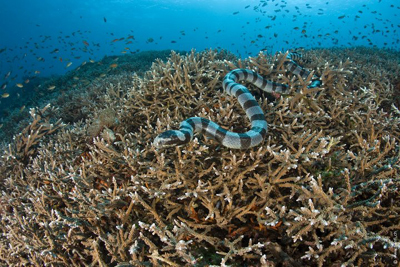 Low coral patches and bommies provide interesting terrain for some very fascinating critters. Scorpionfish, stonefish, lionfish, squid, velvetfish, waspfish, stargazers, flying gurnards, dragonets, flounders, Zebra batfish, lizardfish, filefish, frogfish, pipefish, seahorses, nudibranchs, shrimp, crabs, cuttlefish, octopuses, eels, Snowflake morays, Shorthead fang blennies, Striped catfish and more. A true muck site and home of many unusual critters, this is one of the most famous and frequently dived spots in Lembeh Strait! No corals, just black sand, algae and an occasional patch of sponges. 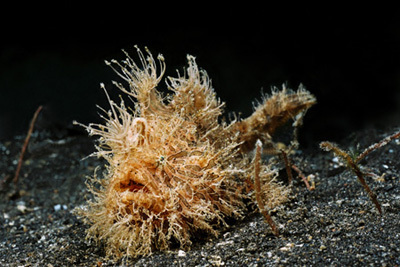 Hairy frogfish, Ambon scorpionfish, snake eels, devilfish, dragonets, cuttlefish, stonefish, lionfish, filefish, velvetfish, waspfish, stargazers, flying gurnards, pipefish, many species of shrimp and crab, six varieties of octopus (Mimic, Mototi, Hairy, Coconut, Wonderpus & Longarm) and more. This patch reef located near a pearl farm consists of a mix of corals and sponges and a long sandy slope. 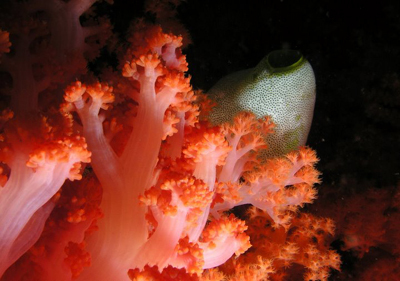 Spot tiny white pipefish among the mushroom corals and enjoy an amazing variety of nudibranchs. 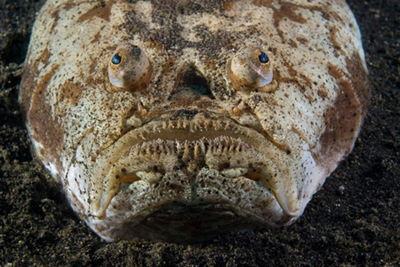 Also frequently present are flying gurnards, devilfish, Leaf scorpionfish, cuttlefish, snake eels, sea horses, sea moths, Mimic octopus, lionfish, Humpback scorpionfish, Long spine wasp fish, Fingered dragonets, flounder, Carpet sole, lizardfish, filefish, frogfish, a wide variety of shrimp and many more critters. Mating Mandarin fish frequent this sheltered series of hard coral lava bowls in the evening. 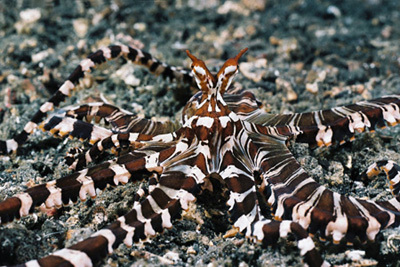 This is also a great place to spot the Blue-ringed octopus, as well as lionfish, Leaf scorpionfish, lizardfish, filefish, frogfish, pipefish, flounder, Pajama cardinal fish, Latticed sandperch, Razor fish, cowries, squat lobster, crabs, Bigfin reef squid, Broadclub cuttlefish, morays, Shorthead fang blennies, Striped catfish, a wide variety of nudibranchs, and shrimps galore. 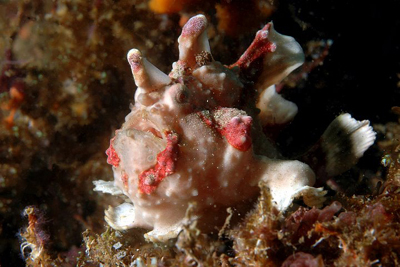 This sheltered dive site features soft corals, gorgonian fans, and sponges and is home to frogfish, nudibranchs, basket stars, octopus, morays, ribbon eels, cuttlefish, pygmy seahorses, and more. This site features a set of steep underwater pinnacles complete with many cracks and caverns to explore. Colorful soft corals and gorgonians provide a backdrop for batfish, bannerfish, fusiliers, and snapper. Underwater pinnacles covered in colorful soft corals, elephant ear sponges, branching green cup coral, table coral, and gorgonians. Possible sightings include schools of batfish and angelfish, tuna, jacks, lionfish, sharks, barracuda, parrotfish, pygmy seahorses, surgeonfish, triggerfish, snapper, longfin bannerfish, frogfish, harlequin sweetlips, and a whole lot more. A steeply sloping rock plays host to macro life galore. 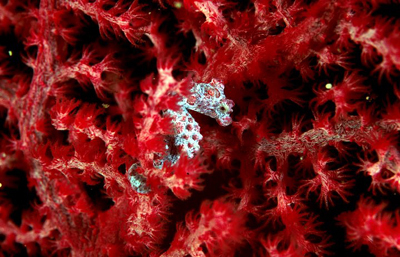 Look for ornate ghost pipefish, nudibranchs, mantis shrimp, and more. 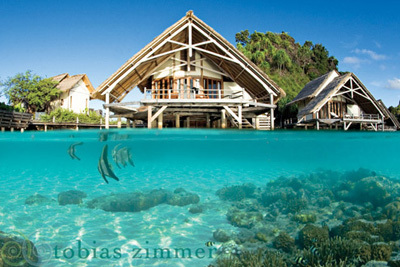 This is one of the best house reefs in the world! 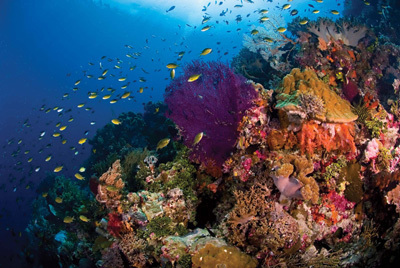 The reef starts right off the beach and drops off about 80 yards from shore, presenting you with a colorful tableau of soft corals, gorgonians, tunicates, whips, and sponges. Look for frogfish, stonefish, blue ring octopus, morays, blue spotted stingrays, ghost pipefish, shrimp, gobies, juvenile reef fish, giant clams, turtles, and a resident school of jacks. This diverse dive site is concentrated around a shallow, gently sloping coral garden leading to an overhang. The main attractions are cuttlefish, ghost pipefish, pygymy seahorses, razor and rockmover wrasses, frogfish, pegasus seamoths, and a school of resident batfish. This patch reef is named for the concentration of unusual critters that can be found here. 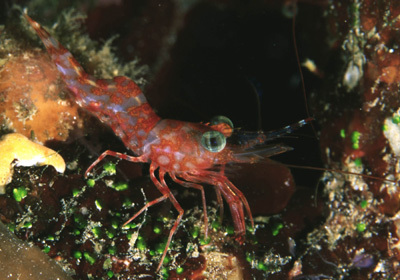 Look for macro life such as frogfish, ghost pipefish, mantis shrimp, leaf fish, squat lobster, pygmy seahorses, and mushroom pipefish. Dusk brings out the mating mandarin fish, while nocturnal species such as cuttlefish, flatworms, lionfish, squid, octopus, and a variety of shrimps and crabs prefer the cover of night. 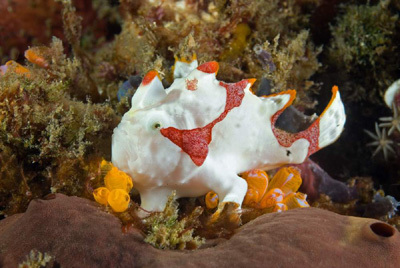 A coral-covered ridge is home to numerous frogfish while the fringing reef hides pygmy seahorses, nudibranchs, flatworms, and a variety of shrimp. This steep slope is overflowing with beautiful corals just waiting to be explored. Just a few of the sightings you’ll enjoy are schools of jack and snapper, barracudas, sweetlips, cuttlefish, and anthias. This is a very versatile site. The reef top is a great spot for snorkelers, while trimix rebreather divers are able to explore life at greater depths. This coral covered pinnacle is like a colorful garden, ripe with life! Large schools of fusiliers, butterflyfish, sergeant majors, snapper, red tooth triggerfish, anemones and clownfish, banded sea snakes, ribbon eels, leaf scorpionfish, rockmover wrasses, spindle cowries, winged pipefish, and carpet anemone shrimps all put in an appearance. This site is named for a colony of white garden eels that live in a stretch of sand at the top of the reef. Perhaps the best feature of this site, however, is the beautiful wall which plays host to some large gorgonians and sea fans. This beach dive begins on a black sand slope. Look for nudibranchs and seahorses as you make your way down. A cleaning station at about 50 ft is covered in hingeback shrimp and features a resident moray eel that likes to put in an appearance. 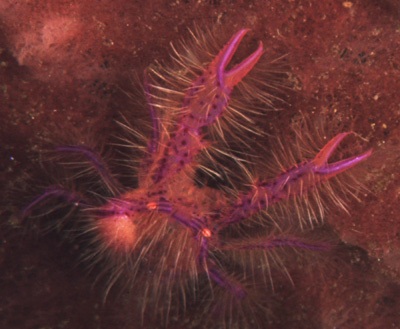 Other attractions include harlequin shrimp, blue starfish, frogfish, and ghost pipefish. This drift dive consists of a large stand of staghorn corals, a steep slope with sponges and whip corals, and a mushroom coral block which provides shelter to a school of glassfish. In August and September it is frequented by the gentle, gigantic Mola Mola’s. A steeply sloping wall of hard and soft corals is home to unicornfish, snapper, and butterflyfish. 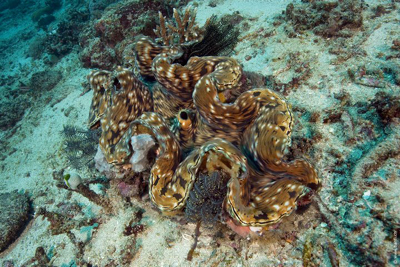 Look for morays, giant clams, and white tip sharks. This is another site that is frequented by Mola Mola’s in August & September. The island of Lombok lies about 34 miles east of Bali. 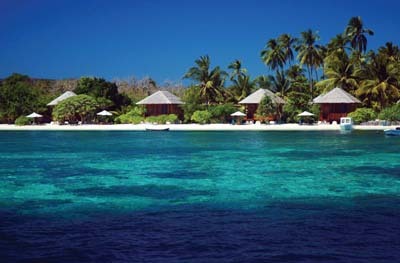 Just off Lombok’s northwest coast you’ll find the coral ringed Gili Islands. Over 20 dive sites offer drop-offs, plateaus, and slopes to explore. Here are a few favorites. This site, located off the southern tip of Gili Trawangan, is a gentle slope marked by coral bommies, table corals, and soft corals. Common sightings include groupers, snapper, sweetlips, angelfish, and parrotfish. 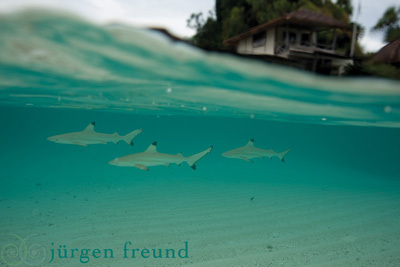 White-tip and black-tip sharks, stingrays, and turtles like to hang out where the slope bottoms out. This deep wall off the east coast of Gili Air offers pristine corals and sponges and is frequented by sharks, as well as huge schools of tuna, trevally, barracuda, jack, and snapper. Sea mounds and canyons covered in hard and soft corals make for interesting terrain to explore. Search for huge sea fans, barracuda, tuna, triggerfish, snapper, stingrays, and turtles. 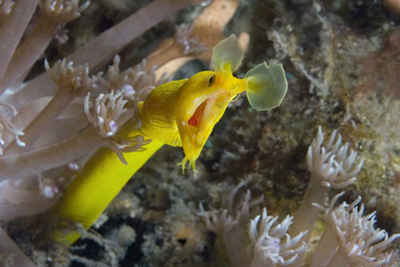 Garden eels can be found on the white sandy bottom. Leopard sharks, white-tips, and black-tips have also been known to put in an appearance. 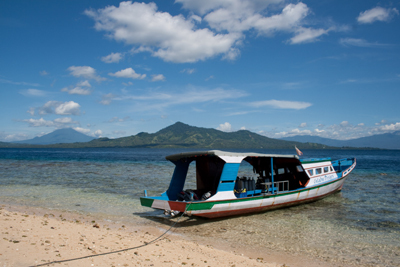 This dive site is located off Gili Air’s north coast. 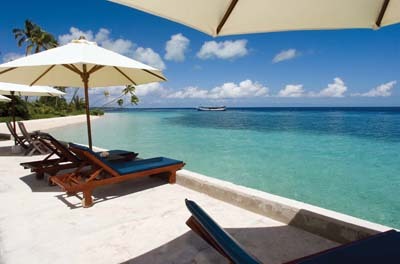 It consists of a gently sloping reef with a white sandy bottom and coral bommies scattered about. A very relaxing, yet eventful dive. 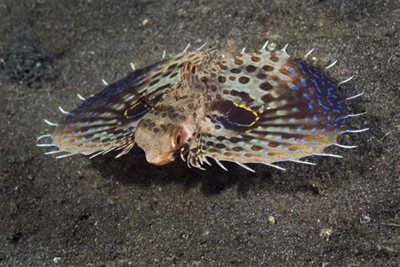 You’ll see batfish, angelfish, boxfish, frogfish, and leaf scorpion fish. 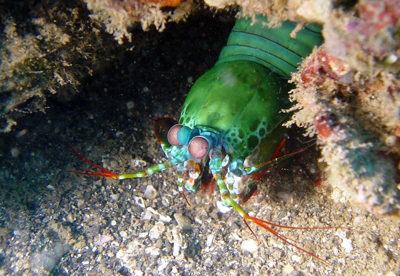 A closer inspection will reveal seahorses, morays, pipefish, mantis shrimp, and nudibranchs. As its name suggests, this is an excellent site for spotting larger pelagics. Look for white-tip and black-tip sharks, jacks, barracuda, tuna, trevally, angelfish, snapper, groupers, batfish, parrotfish, triggerfish, puffers, surgeonfish, blue-spotted stingrays, and moray eels. 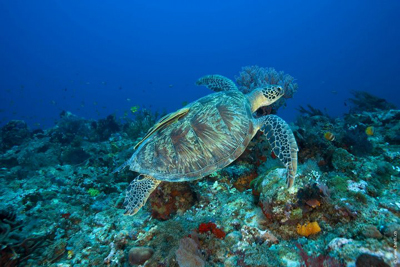 Turtles tend to hang out in the shallower areas among the soft corals. Two levels of cottages, Standard and Superior, are available. The Standard Cottages are a bit older than the Superior Cottages and are situated closer to the office and the resort entrance. The Superior Cottages (left) are large and light with two big windows. Two of these Superior Cottages feature an extra room with two single beds (ideal for families). 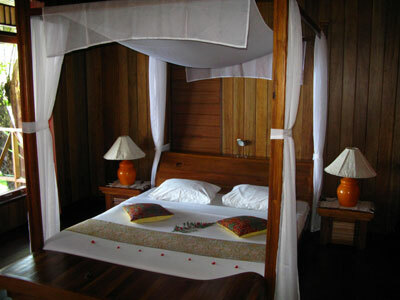 The cottage interiors are simple and functional with comfortable beds. The windows and a ceiling fan ensure a natural cool breeze if you do not want to use air conditioning. Each cottage has its own terrace with a stunning view over the gorgeous garden, the pool and Bunaken National Marine Park. Enjoy a cup of tea or a drink on the sea view terrace before dinner. 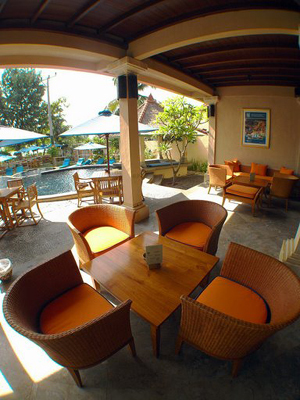 The restaurant offers an extraordinary mixture of Indonesian, Italian and international cuisine. For over twenty years, Murex has been sharing the treasures of Bunaken National Marine Park, Bangka Island, Lembeh Strait and the Sangihe-Talaud archipelago with lucky divers from all over the world. What began as one of the first dive resorts in the area has grown into 3 dive resorts and two liveaboards. 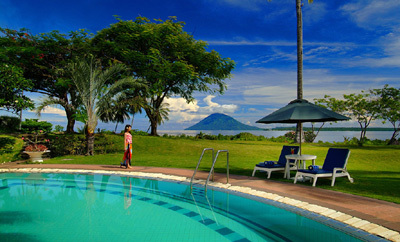 Murex Manado Resort, which started it all, features nineteen rooms set within lush tropical gardens. Delicious traditional cuisine is served buffet-style and includes a wide variety of fresh options for breakfast, lunch and dinner. A weekly barbeque banquet is also enjoyed. 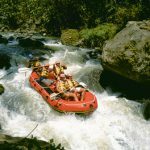 In addition to your diving schedule, spectacular tours and adventurous activities such as volcano trekking or white water rafting may also be arranged. Enjoy the relaxed, friendly atmosphere and let yourself be charmed by the legendary Manadonese hospitality that keeps guests coming back again and again! Located on Tanawangko Bay, on the Northwest coast of Manado, Tasik Ria Resort is conveniently positioned for easy access to Bunaken National Park. Twenty pool-view rooms are situated around a freeform swimming pool while fourteen sea-view cottages with private verandas are set along the water amid lush landscaping. All rooms feature air conditioning, mini-bar, cable TV, IDD phone and safety deposit box. 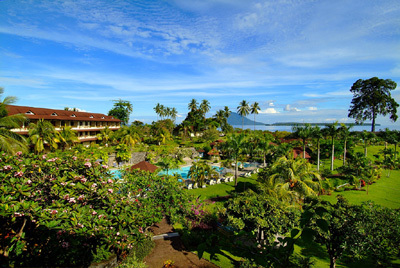 The four star Santika Resort, built on lush tropical grounds, successfully balances Western demands with local atmosphere. 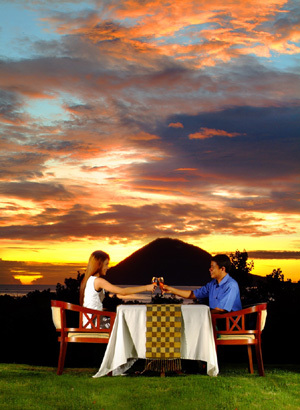 While the location of the resort is ideal for exploring the underwater wonders of Bunaken National Park, the resort itself provides a relaxing, picturesque home base. Guests choose from three levels of accommodation. 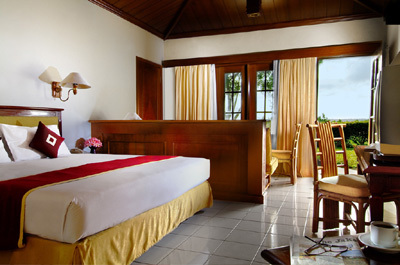 Housed in 2 main buildings on either side of the Balinese style lobby, are the Deluxe (left) & Premier rooms. The Deluxe rooms overlook the gardens & swimming pool and feature a/c, TV, telephone, mini-bar, coffee & tea making facilities, and hot showers. 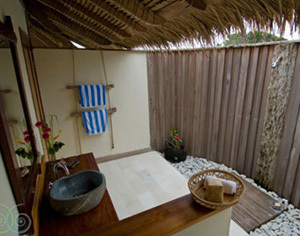 The Premier rooms enjoy stunning views of the islands of Bunaken National Park and feature bathtubs in the bathrooms. 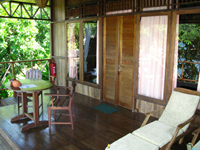 One room Garden Bungalows are also available. These are spread throughout the premises and feature private gazebos and terraces in addition to all the same facilities of the Premier rooms. Overlooking Manado’s Wori Bay, and just 15 minutes away from the underwater wonders of Bunaken National Park, you’ll find the tranquil and luxurious Kima Bajo Resort & Spa. 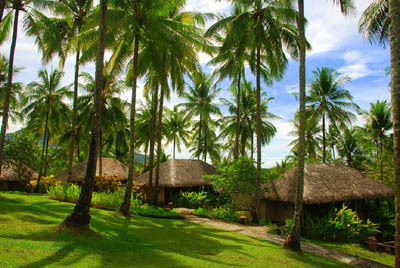 Nestled among coconut palms, this upscale boutique resort offers 19 Bunga Villas, 1 Grand Villa Suite, and 12 spacious Longhouse Rooms. 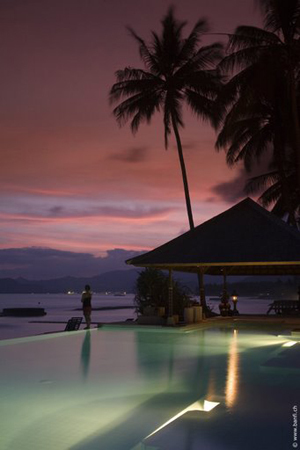 After an amazing day of diving, sit back and enjoy a gorgeous sunset over the Celebes Sea from the resort’s private beach. 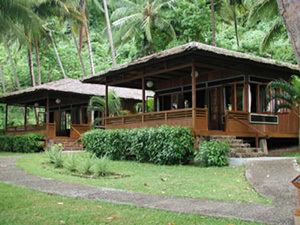 The 19 Bunga Villas (left) enjoy either a sea or garden view and feature air-conditioning, one super king or two single canopy beds, an outdoor sunken bath & shower, an indoor western bathroom with shower, a private balcony, mini bar, separate water heater, satellite TV, telephone, WiFi internet, safe deposit box, tea and coffee making facilities, hair dryer, and guest toiletries. The exclusive Grand Villa Suite is actually two adjoining, air-conditioned suites, one with a king bed, the other with two twins, and each with a private entrance. The suite features a private swimming pool and a covered sun deck. 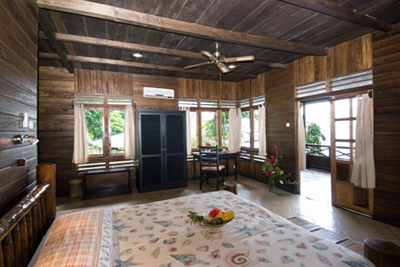 The 12 Longhouse Rooms (right) feature tropical garden views, air-conditioning, two twins or one king-size bed, connecting rooms, private ensuite western bathroom with shower, mini bar, individual water heater, satellite TV, telephone, WiFi internet, safe deposit box, tea and coffee making facilities, hair dryer, and guest toiletries. 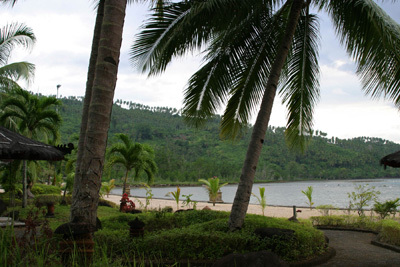 Opened in early 2004, Minahasa Lagoon is situated on the mainland coast of North Sulawesi. 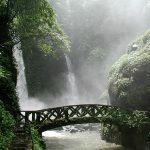 Surrounded by tropical rainforest, bordered by an expansive private beach & crossed by a picturesque mountain river, it is 20 miles southwest of Manado. 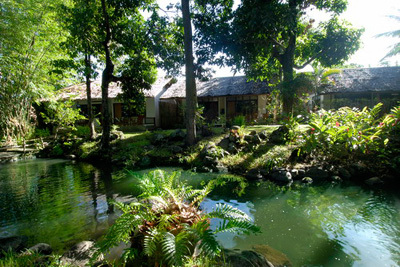 The resort offers 15 cottages, all with the same layout. Two of the cottages are connected through a covered terrace for group or family stays, and another two are wheelchair accessible. 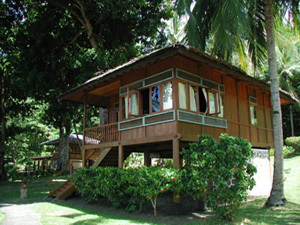 Each cottage is comprised of a spacious bedroom, an adjoining room with a bunk bed, a large open bathroom and a broad wooden terrace complete with ocean view. All cottages offer A/C, ceiling fan, mini bar, tea & coffee facilities, hot water, IDD telephone, internet availability, safe, hairdryer and toiletries. Electric sockets carry 220V & require double pin plugs. 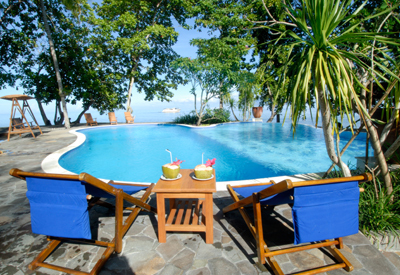 Onong Resort is situated on Siladen Island, a small and beautiful island in Bunaken National Marine Park. 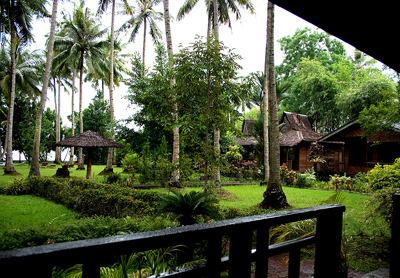 The resort offers 4 Beachview Cottages and 3 Gardenview Cottages, all built in the traditional Minahasa style from northern Sulawesi. 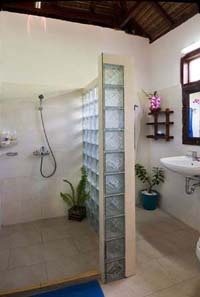 All cottages have private bathrooms with hot showers, ceiling fans, and air-conditioning. 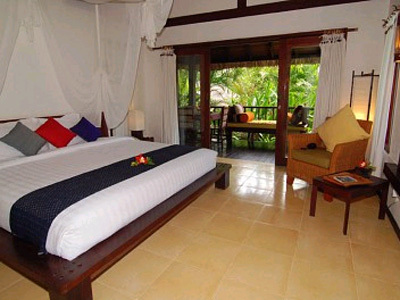 The Beachview Cottages are situated directly on the beach and feature two large windows and a terrace with a stunning view over the sea and Bunaken National Marine Park. The Gardenview Cottages do not have a sea view. 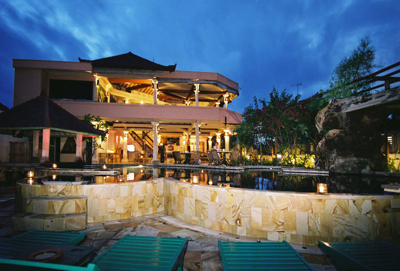 The restaurant offers an extraordinary mixture of Indonesian, Italian and international cuisine. Before dinner, guests may enjoy an appetizer either on the beach or in the cozy sitting area inside the restaurant. 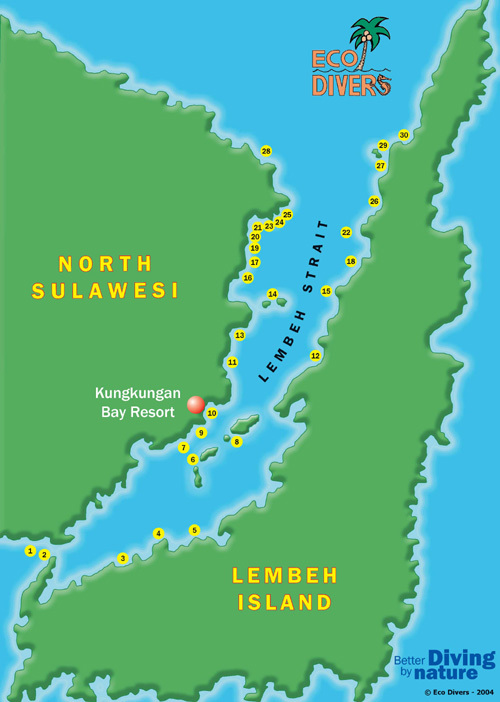 Located on the site of an old coconut plantation on the Sulawesi coast of Lembeh Strait, KBR is within 15 minutes of 40 amazing dive sites. Choose from three room categories. 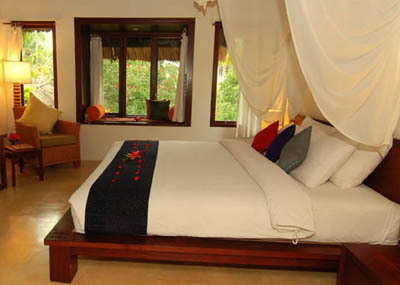 (8) Cottage Suites feature an air-conditioned bedroom, large separate sitting room with veranda, ceiling fan, mini-bar, hair dryer and large shower room. (3) Traditional Houses feature 2 queen beds, cable TV, ceiling fan, air-conditioning, mini-bar and well-equipped shower room. The L-shaped construction provides privacy for each bed. There is (1) Family Traditional House that offers two bedrooms connected by a lounge area. 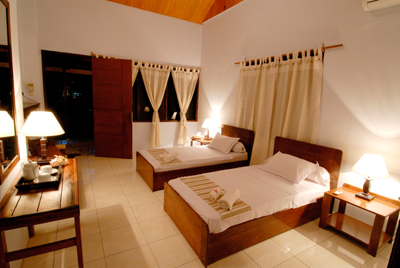 The main bedroom features a king bed, while the smaller bedroom has two singles. (4) Deluxe Rooms feature an open layout with a huge living area, king bed, spacious veranda, large bathroom with bath facilities, mini-bar, tea and coffee maker, hair dryer and cable TV. Additionally, a two-story Deluxe Room with a stunning view (the Hillside Villa) offers the ultimate in intimacy and exclusivity. Eco Divers Resort Lembeh is a boutique resort offering a unique personalized dive service, combining liveaboard-style diving with modern accommodations and exceptional cuisine. 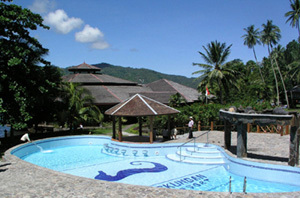 The resort also represents the absolute best value for your money in the Lembeh Strait. Four Guest Accommodation Buildings house 3 guest rooms each. 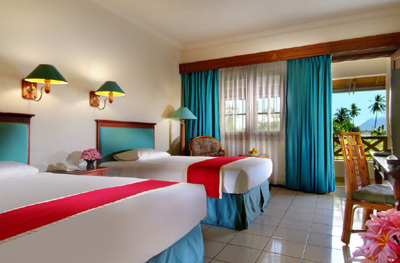 All 12 air-conditioned rooms are comfortably furnished with single, twin or double beds. 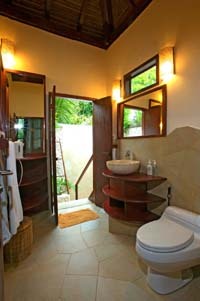 Each room has a private ensuite bathroom. Within each building there is also a camera room, quiet lounge with book library and a private dining room. 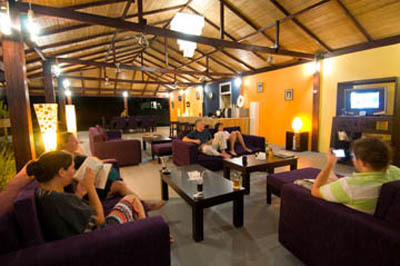 All Guest Accommodation Buildings are air-conditioned throughout. There is an outdoor restaurant and lounge bar with satellite TV, free WiFi throughout the resort, a boutique, a garden & a spa. All food is prepared fresh on a daily basis. Guests order their dinner each morning from an a la carte menu, after which the chefs go to the local market to buy fresh produce. 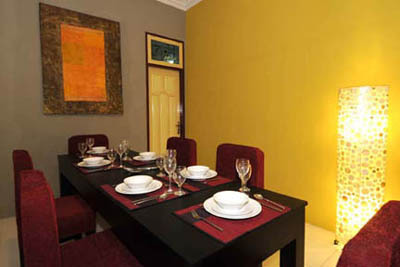 You may also choose a unique dining experience in your private dining room with personal chef and hostess serving. Outdoor BBQs are regularly arranged. 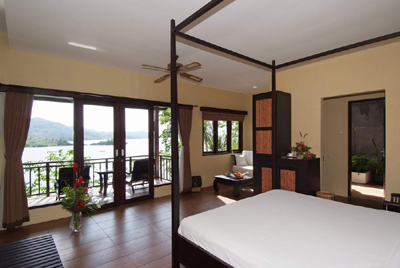 Tucked into the lush landscape of Lembeh Island, the spectacular Lembeh Resort overlooks and provides easy access to the critter mecca that is Lembeh strait. 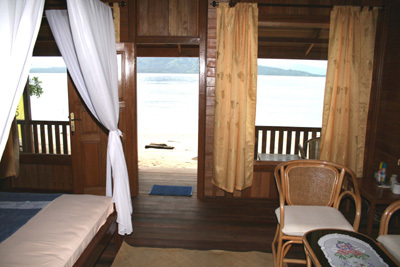 Fourteen spacious cottages feature wide verandas for enjoying the glorious North Sulawesi sunsets. 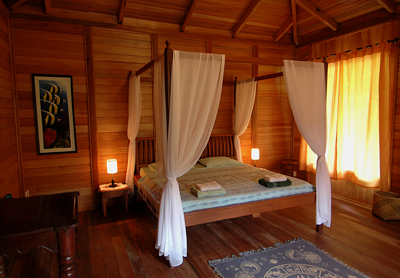 Cottages 1-7 are traditional wood cabins with twin or double beds. 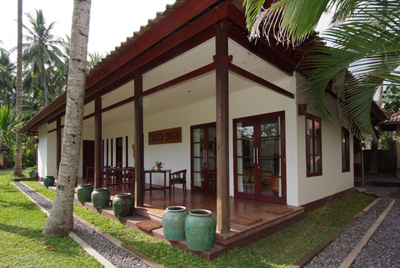 Cottages 1, 2, 5 & 6 are detached with private verandas. Cottages 3A, 3B, 4A & 4B each feature 2 bedrooms, a shared veranda and an adjoining sitting room which is able to sleep 2 additional people. 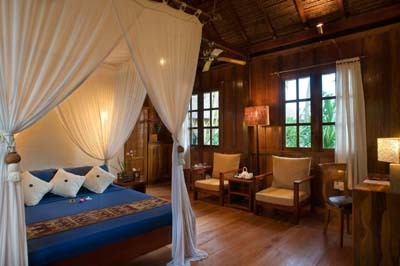 Cottage seven is the Garden Suite and features a bedroom, sitting room, inside bathroom and private veranda. 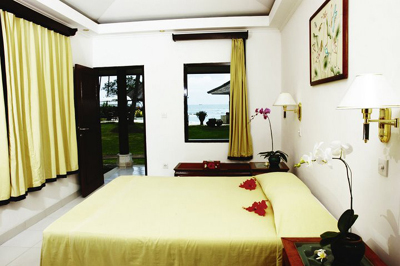 Rooms 8-12 are modern cliff-side villas with twin or double beds and amazing views of the strait. These are well worth the climb! All cottages feature a/c, ceiling fans, open-air bathrooms with bathtub and shower or two showers, custom complimentary toiletries, wi-fi, mini bar, tea and coffee making facilities, drinking water, personal safe and laundry service. 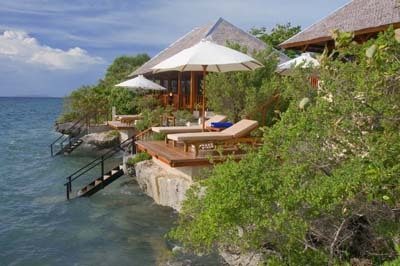 Gangga Island Resort & Spa is located on the tip of Gangga Island, about 3 miles off the coast of North Sulawesi. 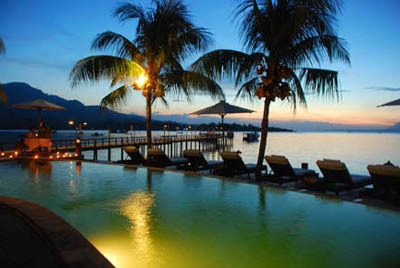 The resort’s location makes it an ideal starting point for exploring the wonders of Bangka Island, Bunaken National Marine Park, and Lembeh Strait. Following your pick-up from the Manado International Airport, you’ll enjoy an hour long drive through the North Sulawesi countryside and a short boat ride across the strait. 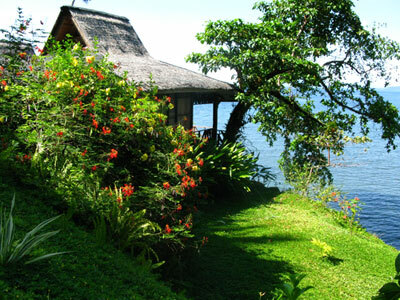 Upon arrival at the resort, you’ll be greeted warmly and shown to your bungalow. 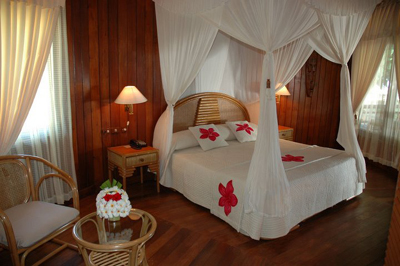 Fifteen wooden bungalows are situated along the white sand beach in the shade of coconut trees. Each bungalow features a high ceiling, a spacious veranda overlooking the beach, elegant furnishings, air-conditioning, ceiling fan, satellite TV, bathroom with hot water, tea and coffee making facilities, and a mini-bar. 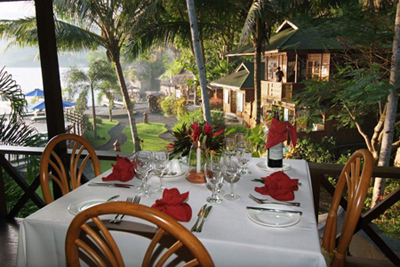 The resort boasts two open-air restaurants and a full bar. The main restaurant offers Mediterranean & Indonesian dishes made from fresh, local ingredients. 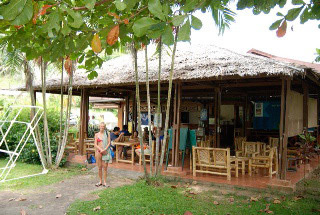 The more casual Bamboo Restaurant is set under the coconut trees and features live, local music and fresh fish barbeques twice a week. Visit the Coconut Bar for your favorite tropical drink. It’s open all day long. 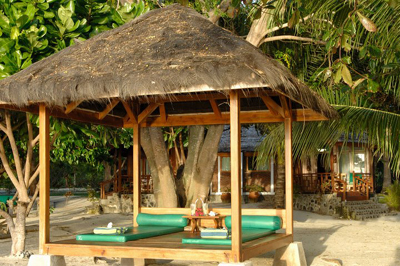 Lotus Bungalows is located on the east coast of Bali, one of the most beautiful and culturally rich places in the world. Situated right on the beach under swaying coconut trees, the resort enjoys a quieter and more secluded feel than the more touristy areas to the south. 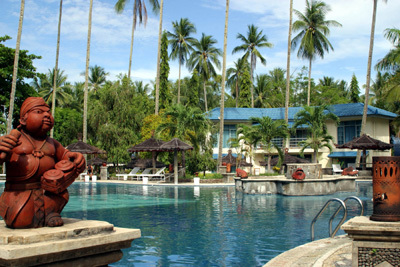 It is located in the village of Candidasa, an hour and a half from the International Airport. Enjoy the unspoiled natural beauty of the surroundings while experiencing a high standard of service and comfort. You’ll quickly learn why Bali is known as the “Island of the Gods”. 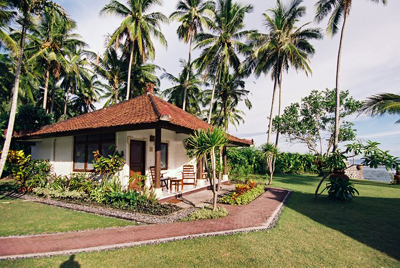 Each of twenty elegantly furnished bungalows features a Balinese-style open air bathroom, an ocean view veranda, beach beds, coffee & tea making facilities, mini bar, hair dryer, and complimentary bottled water. The island of Lombok lies about 34 miles east of Bali. 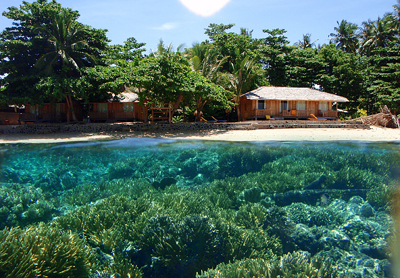 Just off Lombok’s northwest coast you’ll find the coral ringed Gili Islands. 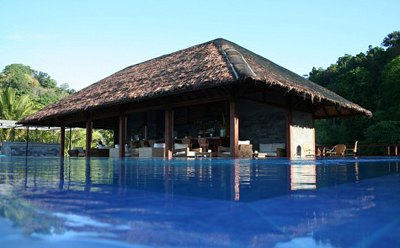 On the largest of these, Gili Trawangan, you’ll find tranquil Villa Almarik. White sand beaches, blue water, pristine coral gardens, tropical vegetation…need we say more? Throw in the fact that no cars or motors are allowed on the island and you’ll know you’re in paradise. Travel includes a 30 minute flight from Denpasar, Bali to Mataram, Lombok, followed by a scenic, coastal 30 minute drive. Another 30 minutes via speedboat, and you’re at the resort. Each of 20 simple, yet elegant cottages features a/c, spacious living area, terrace, traditional outdoor courtyard attached to the bathroom, hot shower with desalinated fresh water, IDD telephone, satellite TV, and minibar. If you’re here to dive, snorkel, and sunbathe, this is the place for you. Just relax and prepare to enjoy. If you need a little more action, Villa Almarik is just a short walk or bike ride away from the local restaurant and bar scene. 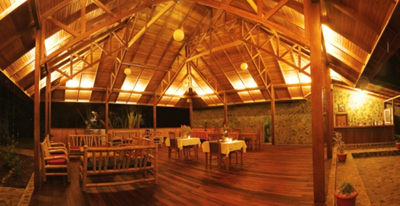 Misool Eco Resort is located in the remote southern part of Raja Ampat. 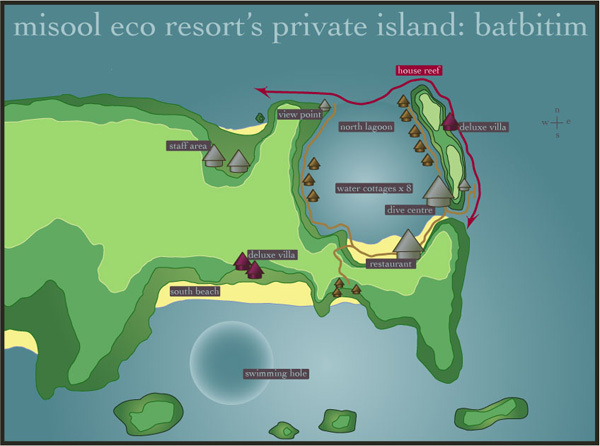 It is on the private island of Batbitim, nestled amidst an archipelago of uninhabited islands & outcroppings. Batbitim is fringed with powder-white beaches and protected by stunning clear lagoons and abundant reefs. With just nine guest cottages, you are assured a holiday of exclusive luxury, at the very epicenter of marine biodiversity. Thanks to its extremely remote, pristine location, you are able to experience the variety and quality of live-aboard diving coupled with all the comforts of a land-based resort. The cottages are built to European standards of comfort and safety, artfully blending indigenous natural materials with meticulous detailing. Eight deluxe Water Cottages rise on stilts over the placid North Lagoon. Each of these spacious cottages features a private veranda on which you’ll enjoy gentle tropical breezes and glorious equatorial views. With steps leading down from your veranda, the house reef is just a few fin-kicks away. Each Water Cottage is equipped with air conditioning, a comfortable bed, mosquito netting, electronic safe, mini-bar, a massive veranda with built in hammock, and a Balinese-style bathroom with an open-air, hot water shower and western toilet. 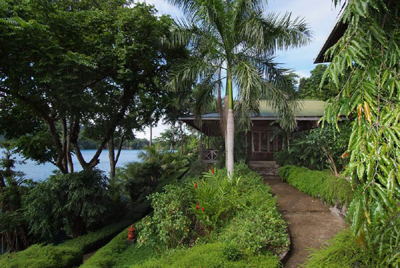 Also available is the Deluxe Villa Tabisasu, located on the eastern edge of the North Lagoon. This gorgeous 2-room villa is conveniently located near the dive center and features a massive outdoor living space that faces east for glorious sunrise views. The air-conditioned bedroom adjoins a separate fan-cooled living room. 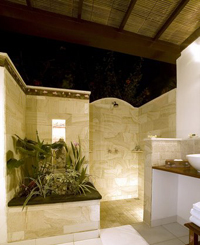 This Deluxe Villa also features a refrigerator, coffee & tea maker, electronic safe, mosquito netting, and a Balinese bathroom with open-air hot water shower and western toilet. 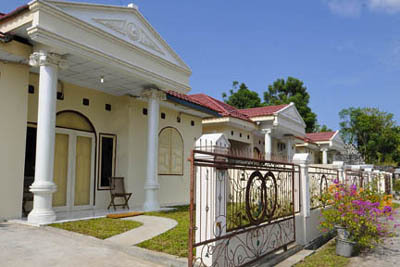 2 more Deluxe Villas are due to be available soon. Located on a remote island in the Wakatobi archipelago, Wakatobi Dive Resort offers perhaps the most pristine reef diving in the world! The resort itself is not your average dive resort. Here, comfort and class are part of the experience. All four levels of accommodation offer spacious floorplans, balconies, lounge chairs, air-conditioning, mini-bars, and either a king-size bed, and/or twin beds to sleep up to 3 adults or 2 adults and 2 children. 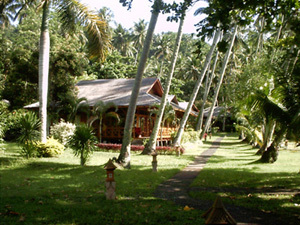 9 Garden Bungalows are situated among the tropical palms, just behind and between the Beach Bungalows. 9 Beach Bungalows (left & below) enjoy a front-row ocean view. Also available are 4 Select Beach Bungalows. These stylish bungalows offer extra large front porches with comfortable lounge beds, and indoor bathrooms with Asian-inspired, spa-style outdoor showers. 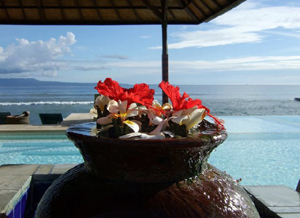 Perched on a rocky ledge overlooking the ocean are the resort’s nicest accommodations. These 4 luxurious Villas have a modern, yet earthy feel and their own individual features. 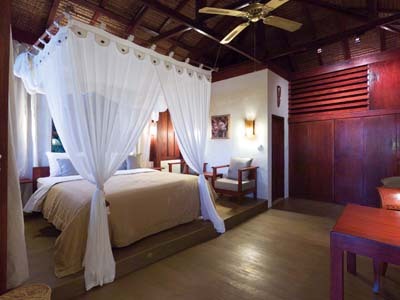 Villa 1 features a beachfront Bale, or “love shack”. 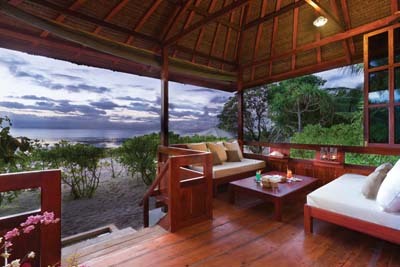 Villa 2 is the very private “Honeymoon Villa” which has its own sundeck and sand garden. Villa 3 boasts an open floor plan, infinity plunge pool and sundeck. 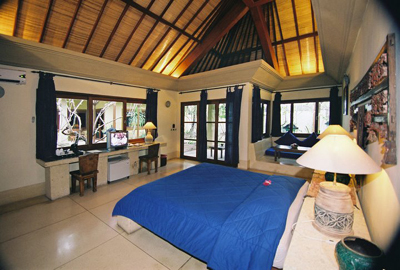 Villa 4 also has an open floor plan and sundeck, and is located closest to the ocean near the boundary between the resort and the nearby wildlife reserve (a great choice for birdwatchers). Most resorts are meal inclusive. Go snorkeling…many dive sites also set the stage for world-class snorkeling. 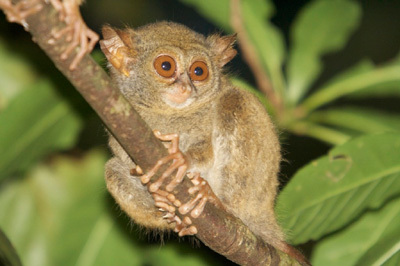 It is located in the Southeast Asia archipelago between the Indian Ocean and the Pacific Ocean. To its north lie the Philippines, Malaysia, Brunei, and Thailand. To its east is Papua New Guinea. To its southeast is Australia. The flight from Los Angeles to Denpasar (Bali) is approximately 22 hours. From New York, it is approximately 27 hours. Total flight time depends upon your final destination in Indonesia. Bahasa Indonesia is the national language. They also have over 580 dialects. English and Dutch are the second major languages spoken. Yes a passport is needed and should be valid for at least 6 months. U.S. citizens are eligible for a Visa-On-Arrival (VOA). The cost of a 30-day tourist visa is US $25.00, and a 3 day visa is US $10.00. This fee should be paid in cash upon arrival at the airport. If you want to extend your stay in Indonesia for reasons other than natural disasters, accident, or illness, you will have to exit and re-enter the country on a new tourist visa. Upon arrival you will proceed to a special counter to have your passport stamped with the VOA visa before going to the immigration clearance desk. The VOA facility is available in the following international airports: Pekanbaru, Padang, Jakarta, Surabaya, Bali, Manado, Halim Perdana Kusama in Jakarta, Adisucipto in Yogyakarta, Adisumarmo in Solo, Selaparang in Mataram, Lombok, Sepinggan in Balikpapan, Kalimantan, Hasanuddin in Makasar, Sulawesi, and Eltari in Kupang, Timor. Please check with the airline company that you are flying with for luggage requirements and restrictions. Yes. Unless otherwise specified, we will arrange all transfers to and from the airport. 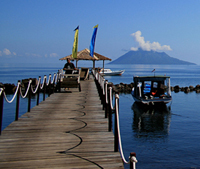 Bunaken National Marine Park- Marine reserve known for beautiful coral gardens, huge walls with soft and hard corals, and large fish like Napoleon wrasse, dogtooth tuna, and barracuda. 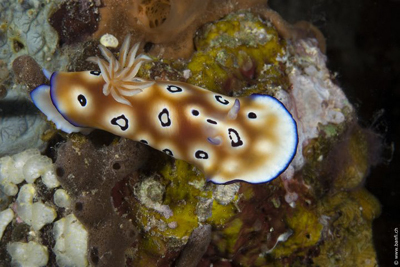 Lembeh Strait – Great muck and critter diving. 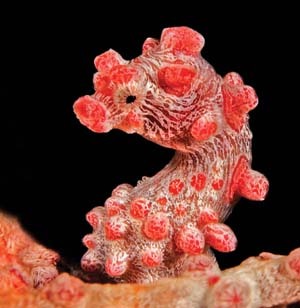 Pygmy seahorses, mimic octopus, ornate ghost pipefish, hairy frogfish, Ambon scorpionfish and stargazers. Inimicus devilfish, dwarf lionfish, pufferfish, pegasus sea moths. Soft corals and a few wrecks. Bangka Island – Soft coral walls, sandy channels, unusual sea critters, and various shark species. Raja Ampat – pygmy seahorses, manta rays, wreck diving. 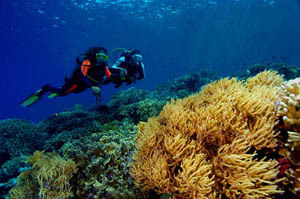 Diving in North Sulawesi is all year round. The sunniest season is between April and October, with a few warm rain showers. 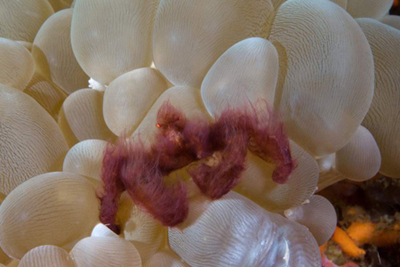 We recommend a 3mm-5mm wetsuit with full arms and legs to protect you from stinging hydroids. Water temperature is usually 80-85 degrees. Lembeh Strait is a little cooler, so a 5mm wetsuit is recommended. 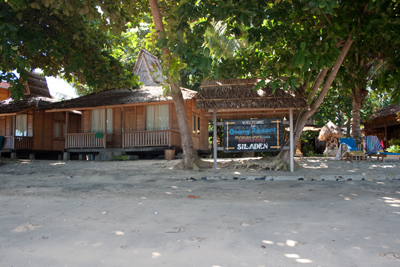 Thalassa Dive Center – 5-20 minutes to sites in Bunaken, an hour to Bangka Island, and over an hour to Lembeh Strait. 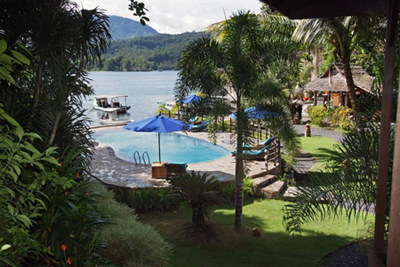 Kasawari Lembeh Resort – The furthest site is 20 minutes away. 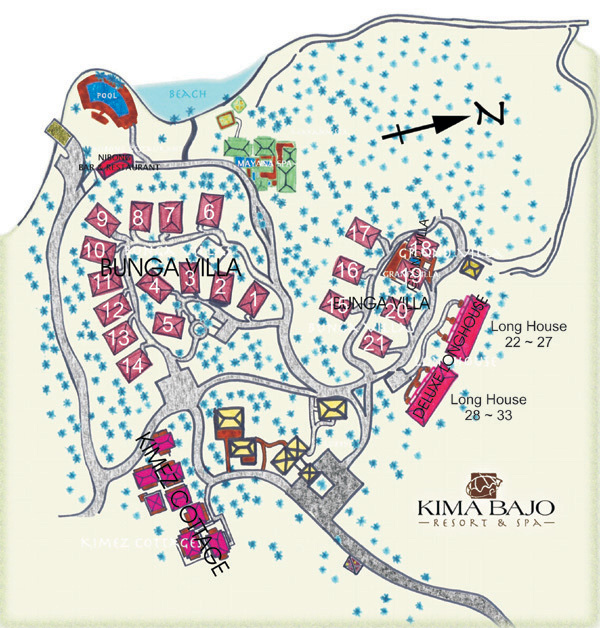 Kungkungan Bay Resort – Most sites are within 15 minutes of the resort. 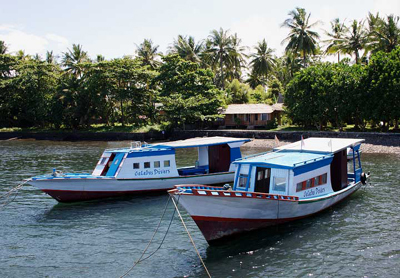 Papua Diving – 5-30 minutes to get to the dive sites. 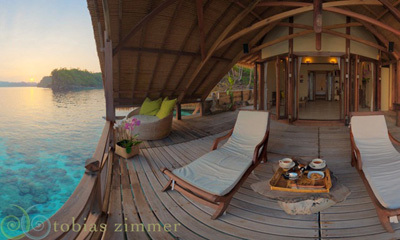 Kasawari Lembeh Resort – First dive begins at 7:30am, followed by a second dive before noon time. Third dive begins at 3:30pm. Night dives are also scheduled. 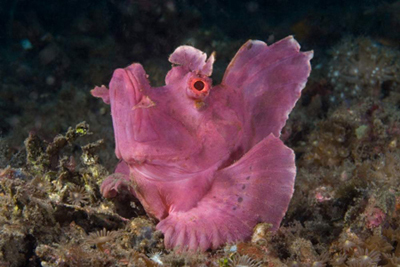 Papua Diving – 3 dives during the day, 1 night dive.